Over this summer period, a national hero was found dead of natural causes. This hero is probably unknown to most New Zealanders, and is unusual in that he was of the kakapo variety. Conservationist Don Merton holds Richard Henry - a bird he named after the revolutionary Irish conservationist Richard Henry who came up with the idea of island sanctuaries. Richard Henry was perhaps our most famous nocturnal parrot, the last of the Fiordland kakapo, and a crucial patriarch to kakapo-kind. Richard Henry was named for his more well-known namesake – that forward-thinking Irishman who spent years living in the remote Dusky Sound in Fiordland, where he watched and learned the ways of some of our most beloved birds, including kakapo and kiwi. “…just now the “lords of creation” have imported ferrets and weasels that prey on all such things that sleep on the ground, as kakapos cannot be expected to learn in a day what their race had forgotten for thousands of years, the chapter of their history is in all likelihood coming to a close. Sadly, after six years of translocations, he spotted a ‘weasel’ on the island and realised that his work had been in vain. Almost a century later, in 1980, a research trip showed no kakapo on the island. But Richard Henry’s hard work hadn’t been for nothing. His techniques, which included island translocations and the use of muzzled dogs to find kiwi and kakapo are still used today by rangers and scientists. 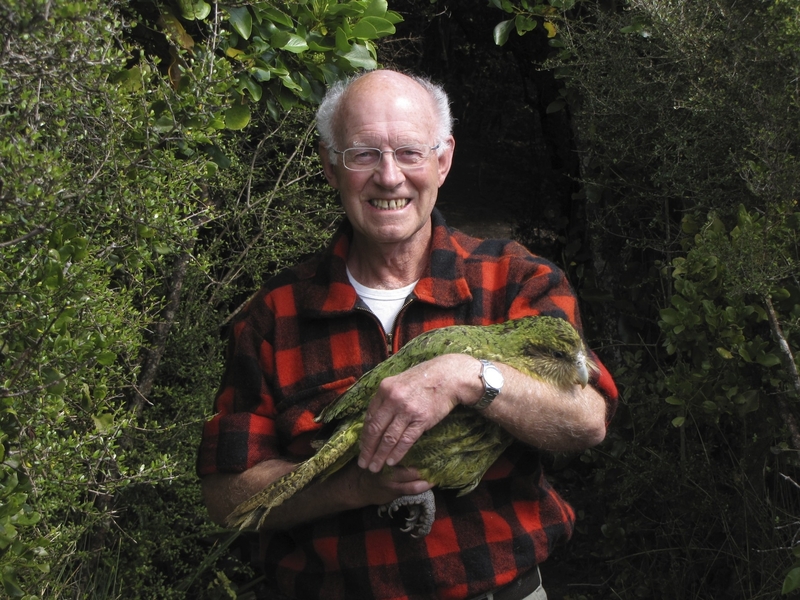 So it was only right that esteemed conservationist Don Merton should name the first kakapo found in many many years in 1975 after the inspiring conservationist that first tried to save them. Richard Henry (the Second), was first discovered high in the misty mountains of Fiordland in 1975. No-one will ever know how old he was when he was found, but scientists estimate that he could have well hatched in the 1930s (or even earlier! ), which was when kakapo were last relatively common in Fiordland. That means that this venerable old patriarch could have been at least 80 years old and possibly older when he died. He enjoyed a varied lifestyle from that point, and travelled to Maud, Chalky and Codfish Islands – where he eventually remained. While on Maud Island, he bred with a Stewart Island female, Flossie, and fathered three chicks in 1998. Their genes are now crucial to the kakapo species, because only Richard Henry carried genes from the Fiordland population, the remainder of the birds are from or related to the Stewart Island kakapo which were discovered in the Tin Range a few years after the Fiordland discovery (in 1977). Because the kakapo population is so small, genetic diversity is crucial for their ongoing survival. Thanks to Richard Henry’s successful breeding, his genes are now playing their part in kakapo conservation. For anyone who has worked on the kakapo recovery programme since 1975, they ‘knew’ Richard Henry more than any other bird, due to his longevity and awesome life story. He was a statesman for kakapo, one of our true natural heroes, and he will be sadly missed by conservationists throughout New Zealand and the world. However, he leaves an incredible legacy, both in his story and the living legacy that remains. Significantly, this year it looks like there will be kakapo chicks hatching on Anchor Island – the first time there will have been kakapo hatched in Fiordland since Richard Henry’s discovery. Forest & Bird are proud to be part of the 20 year Kakapo Recovery partnership along with Rio Tinto and the Department of Conservation. Instead of F&B or as well as having Old Blue with a piccie of black robin, maybe we should have an Oldish Green with a piccie of Richard Henry? The Mockers song “A Winters Tale” was written about Richard Henry IIRC, but I can’t find the album notes online.